Re: Help! Is there any effect of fluoride treatment? Dr. S.B. (dentist): Brooklyn is fluoridated (has been for about 40 years) and I don't generally give in-office fluoride treatments. Still, it seems hard to believe there's something about this case we don't know. Dentists give millions of fluoride treatments, and I've never heard of any acute problems other than upset stomach. Have any of the other dentists out there (esp. those who do administer fluoride treatments) had any serious side effects? Dr. S.M. (dentist): Those side effects are for dosages which one would only encounter in an industrial setting. You would have to eat cases of toothpaste to get to that toxicity level. Kids,,,,,,,,,,,,,,, they vomit their stomach contents long before the fluoride toxicity becomes a concern. If your kid eats an entire tube of toothpaste, he/she will vomit--no worse. Dr. S.B. : That's what I'd think. P.M.: Are you suggesting the kids who died of fluoride poisoning actually died of vomiting? 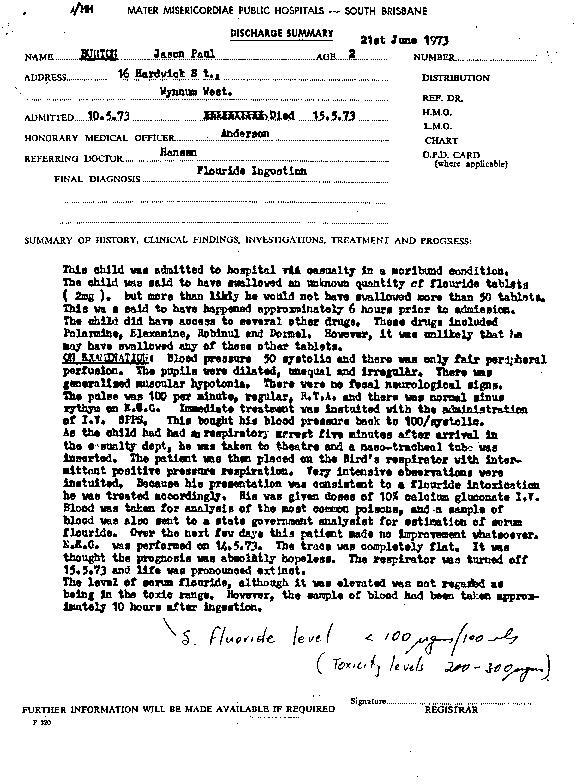 Suggest you read the following documented "case" of a two-years old boy who died of acute fluoride tablet poisoning (Post mortem examination etc. included): http://PMeiers.bei.t-online.de/burton.htm (now: http://www.fluoride-history.de/burton.htm). That was not in an industrial setup. And sure, there were attempts of a cover-up when I mentioned that incident in a local (German) TV discussion (see letter from a Yass dentist to Prof. Schuebel of Duesseldorf who asked him about that case and sent the Yiamouyiannis statement included in his letter. Fortunately I had some contacts in the right positions to get the original documents after a FOIA request). Dr. S.B. : I don't doubt you for a minute, and don't know why anyone (who attempted a coverup--the manufacturer?) would cover up an overdose of any medication. But this is very different from Paul's citing a child dying of an overdose following an in-office fluoride treatment. P.M.: Why don´t you simply surf to the site and look at the documents? There´s nobody to bite you. No virus, not even a "counter". I also know of the 3-y.-old who died in New York of fluoride poisoning after in-office treatment. Dr. S.M. : Ingesting a bottle of fluoride tablets is not the same as eating toothpaste. And,,,,,,,,,,,, the kid died due to body size and quantity of fluoride ingested. I don't expect the kid had the symptoms described. It acted more like rat poison and the kid died. Having said all this, I have not read the article yet, and promise to try during lunch. P.M.: It wasn´t a bottle. It was less than 50 (0.5 mg fluoride each). The parents wrote in a description of the incident that the child probably swallowed less than half a dozen (4 tablets were found at gastric lavage). Fluoride was used as insecticide and rat poison. Related patents can be found at my homepage. There are numerous reports in the medical literature on murder, suicides and accidental ingestion of fluoride rat poison or insecticide (taken for sugar, salt, flour, baking powder etc.). A propos fluoride tablet poisoning: there´s another incident reported from Austria, where a child died after ingestion of less than 200 fluoride tablets. The consulted physician sent the mother home with her child after hearing from the poison control center that no danger would be expected. Dr. S.M. : Then, you are saying the kid swallowed 5 tablets? I find it hard to believe that they lavaged out 4, he kept one and died. does not make logical sense. Even for 27 months old. Dr. S.M. (after lunch): Hey Pete, If you expect this to web-page to begin a cascade effect bringing down all fluoride use, I suspect you will be disappointed. There was a "Death Certificate", but no "Autopsy". How does anyone know what that kid really died of????????? He could have had anaphylactic shock following the administration of some other agent. The Medical Officer may have taken a history from the parents regarding the recent episode with the fluoride tablets, and written that down so he could finish the paper-work and get back to watching the soccer game. P.M.: Sure there is: http://PMeiers.bei.t-online.de/PM-Report.jpg (scanned). There is also a "discharge summary" from the hospital describing the condition of the child, clinical symptoms and the serum fluoride level (sample taken 10 hours after incident). Dr. S.M. : Okay, I read the additional document. Thanks. That gives more credence to fluoride toxicity. But even so, that is just one case of drug overdose. Still does not relate to the list of symptoms given previously. P.M.: Just one of the lethal cases _reported_. You may know how "anti-fluoride tribe" is usually handled (-> unpublished). There are at least two more that I know of: a lethal fluoride tablet intoxication in Austria; a lethal intoxication with court trial (as mentioned in the NYSCOF post) in New York and reported in the "New York Times", the "Herald Examiner", and the "Spotlight" (as the parents were awarded $750,000: "Boy given lethal dose of fluoride in dental clinic, mothers pleas for medical aid ignored"). There are many symptoms, and even those described in the quoted report, published in the medical literature after thousands of incidents of fluoride poisoning (including murder, suicide, accidents, and events related to caries prevention). Dr. S.M. : But, Peter said the kid died from only one 5 mg tablet of fluoride supplement. How could that possible defy logical thinking? P.M.: I said the parents claimed (in one manuscript) the child had taken less than half a dozen (as described in the Yiamouyiannis book cited). Gastric lavage yielded four tablets. Anyway, the child probably couldn´t have taken more than 100 tablets (each 0.5 mg F- => 50 mg F-) as the bottle didn´t contain more. This is still less than the 5 to 10 g usually regarded as a lethal dose. So, where´s the problem? Dr. S.M. : First, you said the kid swallowed less than half a dozen tablets. Then, when I remind you that the math says if the kid lavaged out 4, he could only absorb one or less. Now, you change and say the child swallowed up to 100 tablets. My only problem is that this case is too poorly documented to be used in an argument. You are free to draw whatever conclusions you wish from it. I don't mind. Just don't expect me to change my opinions based on this example. At the worst, this is a case of drug overdose. At the other end, it could be a case where the child died of some other cause and fluoride was blamed out of convenience. No matter what, it was a genuine tragedy that this child died so very young. -> actually lethal: (less than) 50 mg.
What more [evidence] do you want? 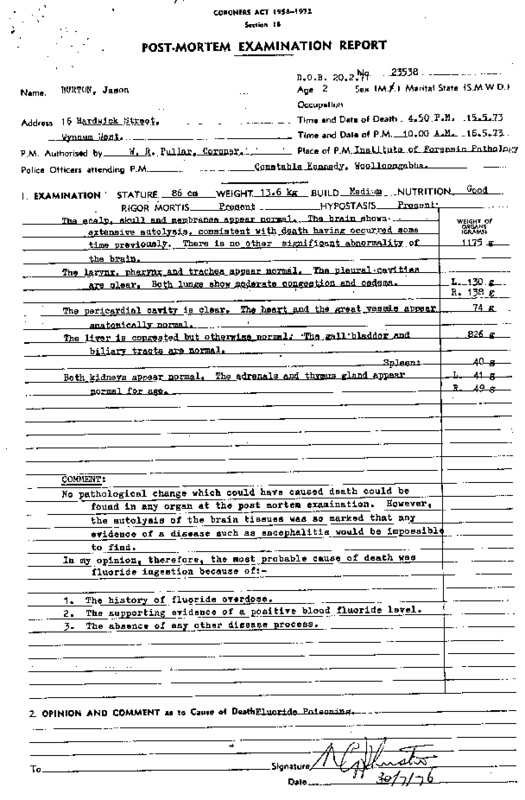 There´s the report from the hospital, a post-mortem examination report, a serum fluoride level - what do you expect? The mother standing by the child and counting the actual number of tablets [as] he swallowed [them]? Dr. S.M. : I don't say it did not happen. I am not trying to change the facts. I am just saying there are insufficient concrete confirmed facts on which I can anchor a boat to. Yes, the certificate says the child died of such and such. But, it says so based on history, not on toxicology. Not trying to argue or change your view of this incident. Only trying to explain what I also see in these reports. Remember, that we are trained to be very skeptical of everything we cannot verify personally, especially if the logic of the presentation is off at all. Dr. S.B. : I actually haven't seen a lethal dose stated, and haven't looked for one, since the therapeutic dose is so much less. Obviously, we use medications all the time where the toxic dose is far closer to the therapeutic dose. For instance, I have seen the toxic dose for our lidocaine anesthetic to be about 10-15 cartridges. I have had difficult or extensive cases where I use 4 or 5 cartridges in a visit. This is as high as I am comfortable going. Of course, most toxic doses are stated for a 70 kg male, so we obviously have to consider the lower absolute toxic threshold in small children. P.B. (dental hygienist): I remember hearing about this case when I was working with a pediatric dentist in Illinois. This hygienist was culpable. When applying fluoride, you never leave the patients side. You continually suction any excess. The symptoms of fluoride toxicity were known even then. We always kept lime juice on hand and notified parents of symptoms and using milk or lime juice to deactivate the fluoride. Dr. S.M. : That famous scientific journal--The New York Times. Dr. S.B. : Well, wait a minute. No one claimed it was a scientific journal. And the "facts" such as they were, came from court testimony, not a scientific paper. Still, some of the facts as stated don't make sense. For instance, it was taken as fact that there was negligence because the patient was not told to rinse with water after the fluoride treatment. When were patients ever told to rinse after fluoride treatments? Also, how can the boy have swallowed 45 cc of fluoride solution unless he got up and drank the bottle? Like I said, I don't give fluoride treatments in my office, but how much can you put in a pedo tray, anyway? In my student days I spent plenty of time at Brookdale Hospital, and (in those days anyway) things happened. P.M.: As I read the article, the boy got the jell on his teeth and was told to rinse with water. How much water could he get in his mouth to rinse? 45 ml, taken from the glass he was offered, sounds reasonable to me. With this water and the highly concentrated jell a solution of 2% SnF2 was formed, as it seems. No bottle involved. Dr. S. B.: Seems to me the article said quite clearly that the child swallowed 45cc of the 2% fluoride solution--he didn't ingest 45cc of water after the (presumably much smaller) volume of fluoride solution was applied. This was clearly an ingestion of a huge quantity of SnF2 solution, not an accidental ingestion of a normal amount that should have been expectorated. P.M.: Interesting interpretation. There were others in dental journals, even the claim it wasn´t a boy but a girl. That´s science - dental science, of course. And that´s why I´m so interested in the history of fluoride. I found that the history of dentistry (and fluoride) is full of such "poorly documented" cases, items and events. 22.5 ml water plus 22.5 ml 4% SnF2 jell makes 45 ml of a 2% solution, or 33.5 ml water + 11.5 ml of a 8% SnF2 jell. What concentration of SnF2 jell was used then(!) ? I guess a toxicologist testifying before a court would know -nearly- what he´s doing (calculating). P.B. : I don't know if it makes a difference, but stannous fluoride was not available in a gel. It is no longer used in private dental offices as a treatment to prevent decay. The solution was "painted" on the teeth with a q-tip applicator. Even in the 1970's most private dental offices were using APF (acidulated phosphorus fluoride) gel with trays. So, this clinic was really behind the times. When working in a pedo practice, I used the high speed suction while administering fluoride, so excess gel was taken up by the suction. Dr. S. B.: I don't mean in any way to trivialize a tragic death. I don't doubt that it's possible to die as a result of an overdose of dental fluoride solutions. But let's keep things in perspective. There are thousands of accidental poisoning deaths in the US every year. If Paul and Peter had to go back 28 years to find this somewhat questionable case where negligence no doubt was involved, I don't see how this can reasonably be taken to demonstrate that in office fluoride treatments are unsafe. P.M.: Would you say the safety question could be decided on the base of lethal poisonings? How many patients get ill after the treatment? Rushes? Symptoms that occur days afterwards but are never seen in the context of this previous treatment? Dr. S. B.: There's enough uncertainty in the newspaper account that I can't draw any conclusions. If the fluoride solution was painted on the teeth as Pat says, I don't know how to interpret the quantity given. If it was used in a tray, I don't see how you could fit 45 cc in a tray. This isn't a dental journal either. If you wish to make a blanket condemnation of the quality of dental science, that's your privilege.